We know him. We love him. Tiny Cooper is back. Remember Will Grayson, Will Grayson? Yeah. That Tiny Cooper. 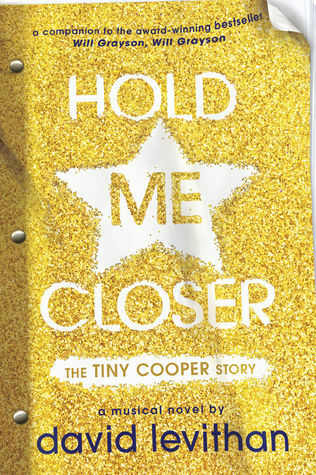 In Hold Me Closer, readers get to experience the musical of Cooper's life that he put on at his high school in Will Grayson, Will Grayson. At first I thought that Hold Me Closer was going to be a bit of a farce -- not very serious and full of nothing but fluff. But I never should have doubted David Levithan. And the fact of the matter is, this is now my favorite Levithan novel to-date. It is a master class in musical theater. Fans of Tim Federle's Better Nate Than Ever are sure to love The Tiny Cooper Story. Levithan has really nailed the genre of the musical. There are upbeat parts, sad parts, hilarious parts and they follow the arc of a musical production perfectly. And even in parts that seem to be utter ridiculousness (e.g., a random visit from the ghost of Oscar Wilde) there are still moments of depth and poignancy. The danger of falling in love is that you mistakenly believe the loved one is the only source of passion in your life. But there is passion everywhere. In music. In words. In the stories you see. Find your passion everywhere, and share it widely. Don't narrow it down to one thin line (150). [The scene] is a perfect picture of what we musical devotees believe -- that the right song at the right time can stop all the clocks, wipe away all the cares, and gently make you see the world in a new way (164). This is how I feel about all music, not just the music contained in musical theater. When the right song at the right time comes on, don’t even talk to me because I have surrendered my body and mind to the pull of the music. Music has always been a life-changing force in my life. I think this is why I am so befuddled when my students want to listen to music while they are doing class work and they don’t consider it a distraction. To me, music is the most wonderful, soul-stirring distraction. I can’t listen to it without thinking about the emotions the song is bringing out of me. And so, as I was reading Hold Me Closer, I couldn't help but hope and get excited at the idea of someone taking this text and turning it into an actual musical production. I have no doubt it will happen. The question is just when it will happen. Hopefully sooner rather than later. I had really been worried about this book--that it wouldn't be fully realized somehow. But you're right: shouldn't have doubted Levithan. Really excited now to read it after reading your review. I wonder if the audiobook will be narrated by the same person who did Tiny's part of Will Grayson2? Loved his work. A friend just gave me her advance review copy of this novel - so I thought of visiting your review here. Would I still be able to understand this even if I haven't read Will Grayson yet?